Click HERE for update on January 17. Busan Korea Alliance for the Prevention of Cruelty to Animals(Busan KAPCA) is a small, but very dedicated Animal Rights organization (registered nonprofit) located in Busan, South Korea which has been fighting to end the cruel dog meat trade since 1999. 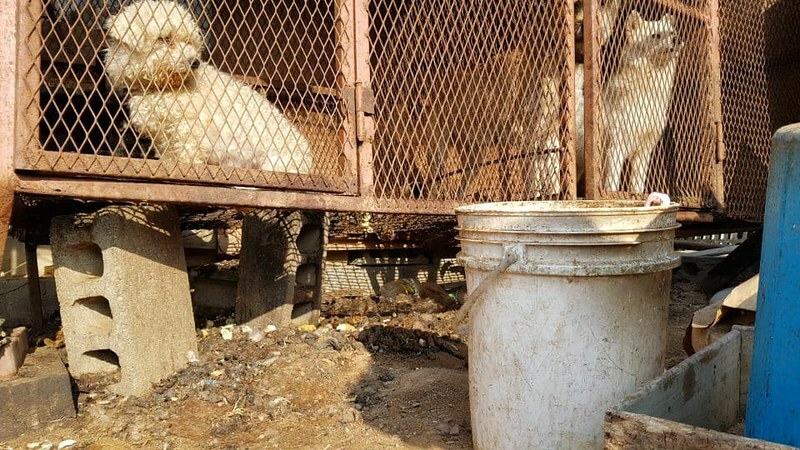 They have tirelessly worked to close down dog farms and slaughterhouses in Busan and the region of Gyeongsangnam-do province. 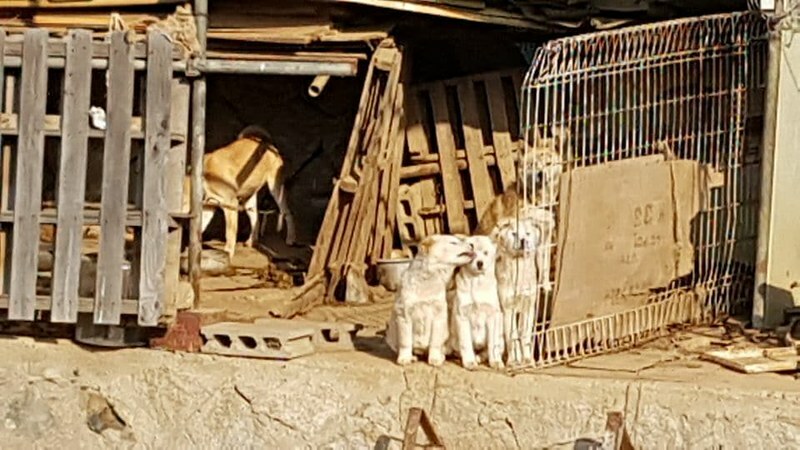 With the cooperation from the city of Yangsan, Busan KAPCA was successful in getting the dog farmer to sign an agreement to shut down his dog farm and release all 27 dogs to them. 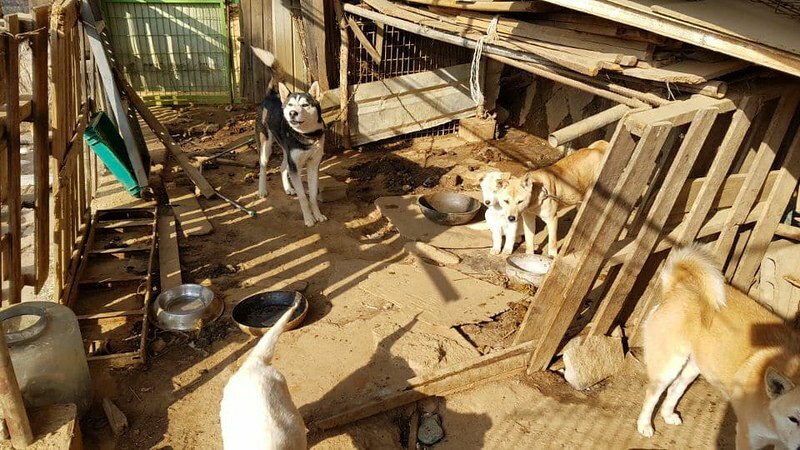 However, Busan KAPCA does not own a shelter to where they can relocate these dogs. They are not in a financial position to provide necessary medical care for these dogs or pay for the temporary housing to keep them safe until they find permanent homes. These dogs would need to be tested, medical care needs to be provided, as well as to be neutered and spayed. They are urgently looking for foster homes so that they can be removed from the dog farmer. They feel an urgency to act because the dog farmer can break the agreement and sell these dogs for meat, any time. 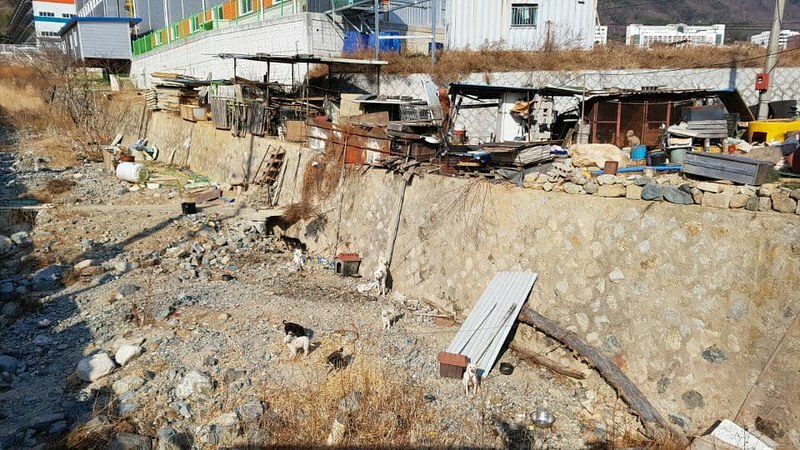 That’s why we, KoreanDogs.org, are trying to help raise funds for Busan KAPCA so that they can relocate these dogs to a safe place as quickly as possible. We are in support of the important and brave work of Busan KAPCA, for many years now. Your donation will go directly to making this rescue and adoption possible. Your kindness and generosity can give a chance at life for these poor dogs who have known nothing but misery and are in frigid cold without any protection. Please donate whatever you can today. Donation of any amount would be greatly appreciated. Thank you for caring!! Click HERE for photos and to learn more. Click HERE for an article on Busan Ilbo featuring Busan KAPCA’s director, Ms.Aera Kim. For donation please use paypal: rucy3@naver.com or the Youcaring.com fundraising page we set up for Busan KAPCA. All funds from Youcaring will go directly to Busan KAPCA. There are 27 dogs which remain at a dog farm in hunger and freezing cold. They include some pure breeds. We had just received a signed promise from the dog farmer to quit, but since we have no shelter, we have no place to relocate these dogs. And we can’t afford to pay for boarding, either. Therefore, we are seeking foster homes for these dogs. We will provide their food to the foster homes. You don’t have to foster all the dogs. However, as many dogs you can foster would be wonderful. These are small and large dogs. 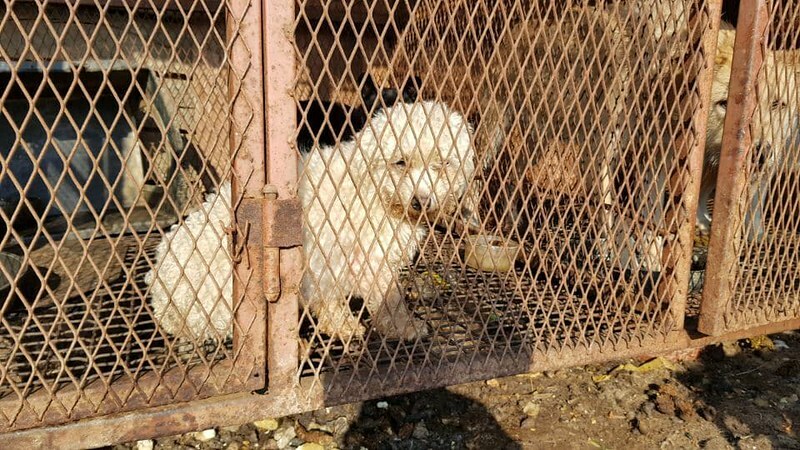 We are afraid that if we don’t relocate the dogs as soon as possible, the dog farmer will sell the dogs for meat. Because the dog farmer is feeding food garbage to the dogs, we also need dog food desperately. We will be responsible for providing the food and the adoption arrangements, and we are looking for foster homes or a temporary facility to relocate them. We are feeling anxious about removing them from the dog farm as soon as it is possible for us to do so. We will update you with more details soon. 살을 에는 추위속에, 굶주림 속에 방치된 27마리의 개농장 아이들이 있습니다. 겨우 포기각서를 받았으나 저희는 보호소가 없어 당장 아이들을 옮길 수가 없습니다. 그렇다고 많은 돈을 내고 위탁할 형편도 안됩니다. 사료를 저희가 제공하고 임시보호를 해줄 곳을 찾습니다. 빨리 임보처를 구하지않으면 그사이 애들을 다른데 팔아버릴까 걱정이 됩니다. 애들 음식쓰레기 먹이고 있어 사료도 절실합니다. 사료와 입양을 저희가 책임질테니 임시보호해줄 곳을 찾고있으니 많은 관심부탁드립니다. 자세한 내용은 다시 업데이트 하겠습니다. Click HERE for more photos from this farm. I checked with Busan KAPCA and they are looking for foster homes within Korea. At the moment, overseas foster home is not feasible. However, Busan KAPCA is able to coordinate overseas adoption. Please contact them if you are interested. Ms. Aera Kim is the founder/director of Busan KAPCA and her email is: rucy3@naver.com.